Manduca sexta caterpillars can grow up to 10 cm long making them ideal for laboratory experiments to investigate their biochemistry and physiology. "Whooo ... are ... you?" asked the hookah-smoking caterpillar of Alice, in Wonderland. Asking the question of the caterpillar instead, an international team of scientists have published their findings from the sequencing, annotation, and exploration of the genome of the tobacco hornworm moth. The project involved 114 scientists from 50 research institutions worldwide, including from the SIB Swiss Institute of Bioinformatics and the University of Geneva (UNIGE). This remarkable moth and strikingly beautiful and very large caterpillar are known by the Latin name, Manduca sexta, but also as the tobacco hornworm, Carolina sphinx moth, goliath worm, or 'Le sphinx du tabac'. The giant caterpillars are a favourite childhood pet, but they are considered serious agricultural pests as they feed voraciously on tobacco, potato, tomato, and pepper plants. The large size of the caterpillars means that this moth has become one of the most important model species for studying insect physiology, biochemistry, and molecular biology, and sequencing its genome opens many new research avenues. The large-scale research project to sequence, annotate, and explore the genome of the tobacco hornworm moth started in 2009 and was led by Prof. Michael R. Kanost from Kansas State University and Prof. Gary W. Blissard from the Boyce Thompson Institute and Cornell University. Their efforts were made possible through grants from the US National Institutes of Health and the US Defense Advanced Research Projects Agency. DNA sequencing and genome assembly were performed at the Baylor College of Medicine, benefitting from Prof. Stephen Richards' experience overseeing genome projects as part of the i5K arthropod genome initiative. Exploring this new wealth of genetic and genomic data relied on the expertise of 114 scientists from around the world, including from the SIB Swiss Institute of Bioinformatics and the University of Geneva Faculty of Medicine. Their findings from exploring the 420 megabasepair genome and its 15'451 encoded genes are published in a comprehensive manuscript in the journal Insect Biochemistry and Molecular Biology. Manduca sexta has a long history of being used as a model species for classical biochemistry and physiology experiments spanning many different areas of research. This is mainly due to the large size of the larvae that can grow up to 10 cm long and weigh more than 10 grams, and which are relatively easy to rear in the laboratory. 'Manduca' from the Latin for 'glutton' emphasizes how the hungry caterpillars can quickly consume several plants to reach such sizes, and 'sexta' for the six orange spots along the moth's abdomen. Such laboratory studies have facilitated great advances in our understanding of many biological processes such as animal development and insect metamorphosis, immune system functions and their roles in interactions with pathogens, the chemistry behind the wars waged between pest insects and the plants on which they feed, as well as many other aspects of insect biochemistry, physiology, and behaviour. 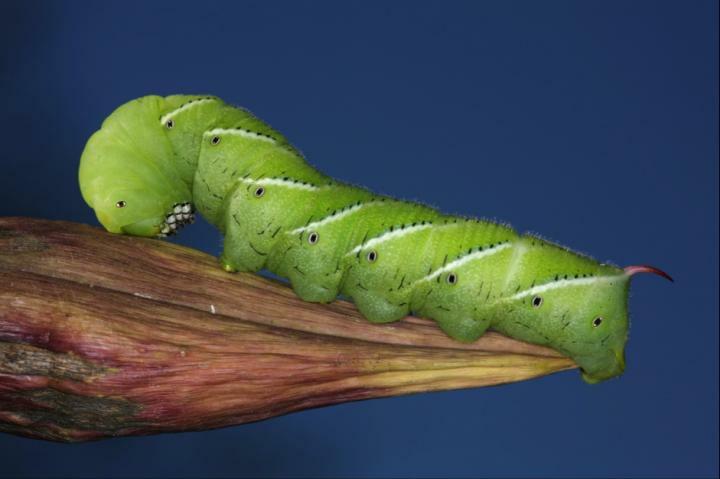 The sequencing and annotation of the tobacco hornworm genome now allows researchers to pinpoint some of the underlying genetic components of the processes that they have been studying - to hunt down the genes or genomic regions that are responsible for the observed effects on the biology and behaviour of this important insect. "In my laboratory we have been studying the immune system for many years", explained Prof. Kanost, "and sequencing the genome has now allowed us to identify almost 600 genes that are likely to be involved in defence against various pathogens." Kanost and Blissard also coordinated the publication of an Insect Biochemistry and Molecular Biology Special Issue with additional research articles that explore particular topics in more detail. Comparing the moth's genes and genome to those from other insects revealed an intriguing peculiarity: "In many insects we know that genes often jump around from one location to another in their respective genomes", described Dr Robert Waterhouse from the SIB Swiss Institute of Bioinformatics and the University of Geneva, "but in moths and butterflies something seems to be reducing their freedom of movement". Prof. Marian Goldsmith from the University of Rhode Island explained that "This exceptional conservation of gene order may be linked to the special structural properties of moth and butterfly chromosomes." The tobacco hornworm genome and its catalogue of genes, made publically available by the authors through the US National Agricultural Library, provides a rich source of genetic information from which to begin to investigate questions about the specific roles of individual genes and genomic elements in various biological responses as well as to learn about how insect genomes have evolved.